Bengaluru - 07 February, 2016: Outride Hunger 2016, is the second edition of the bike rally organised by The Akshaya Patra Foundation to create awareness about bridging the gap between classroom hunger and education. The rally was flagged of by well-known Sandalwood actor Krishna Ajai Rao (aka Sandalwood Krishna), Dr M A Saleem, Additional Commissioner of Police, Bengaluru, Mr R Chakravarthy, 84 years old veteran Biker and Sri Sridham Krishna Dasa from ISKCON. The awesomely fun biking event to raise awareness of Akshaya Patra’s cause of eliminating classroom hunger and illiteracy, featured over 300 participants form the Bajaj Avenger Club – Bengaluru, Biking Buddies, Bikers Of India, Free Spirits Motorcycle Club, Gold Town Bikers, Highwaymen, IBRMC, Royal Indians Enfield Owners Club, Royal Rides Bangalore and individual riders. The 24 kilometre rally began from Akshaya Patra’s Hare Krishna Hill Kitchen on Chord Road, Rajajinagar cruising through key areas such as Malleshwaram, Race Course Road, Lalbagh Road, Kanakapura till Vasanthapura Kitchen on Kanakapura Road. “Classroom hunger is a National challenge and The Akshaya Patra foundation is overwhelmed with the support extended by the bikers to ride for eliminating classroom hunger & illiteracy. With more such initiatives to create awareness, let’s work towards feeding more children,” stated Shridhar Venkat, CEO of The Akshaya Patra Foundation. The Akshaya Patra Foundation has grown from feeding 1500 to 1.5 million students with daily nutritious mid-day meals and yet there is a long way to go in eradicating hunger among growing children to provide them with a healthy body and mind. In partnership with the Government of India and various State Governments and inestimable support from many philanthropic donors and well-wishers; Akshaya Patra has grown from humble beginnings serving just 1,500 school children across 5 schools. 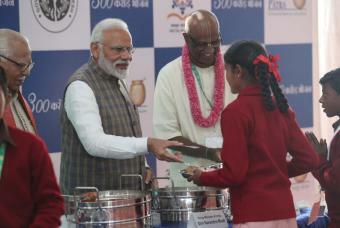 Today, Akshaya Patra Foundation is the world’s largest (not-for-profit run) Mid-Day Meal Programme serving wholesome food to over 1.4 million children from 10,845 schools across 10 states in India.